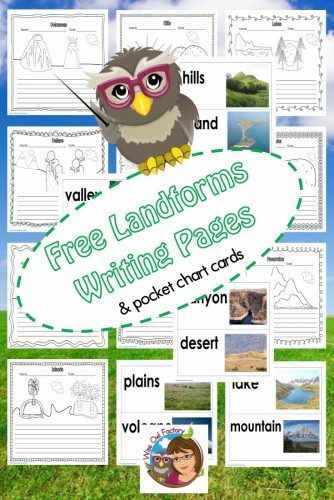 This post has a free landforms writing printable. One book that could be read to children learning about landforms is The Red Book, a picture book for all ages. The story is of the travels of a wordless magical book (yes, the book travels). It is also about the children travel with the book, if they find and read the book. This book is by Barbara Lehman. Of course, hundreds of other books could be used as well, any showing pictures of landforms as part of the story or in nonfiction books. The Red Book is great to use for inferring, because the readers will not understand the story upon the first reading, and will have to figure out the story. This helps increase the thinking skills of the child, and makes for a book that is enjoyable upon further readings. The free PDF printable has 18 pages and is in our free emembers area. 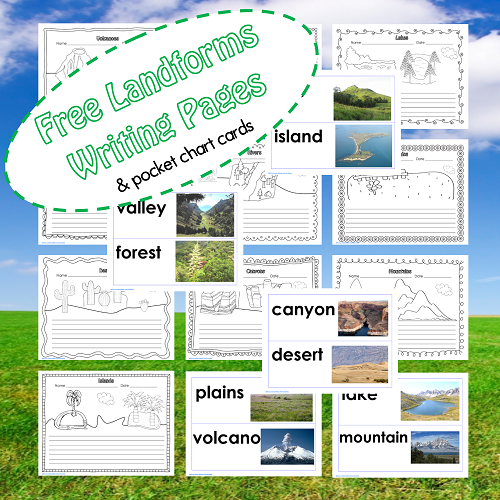 Each page has one land-form term on it, with each word on a pocket chart card, also. I included a drawing response page for students to make their own mini-book as The Red Book is wordless. Teachers may use these pages with their own leveled reading nonfiction resources as the pages are open-ended. 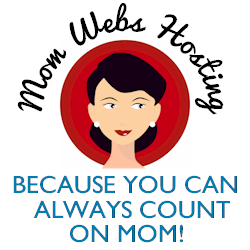 To join, just select the free radio button on the sign-up page to make the priced options disappear. The pocket chart might be hung in the writing center area, with writing page options provided. For differentiation, the words might just be copied on the pages by emergent readers and writers. Or facts could be looked up in appropriate grade level books for the more advanced readers to use to take notes on the writing paper.